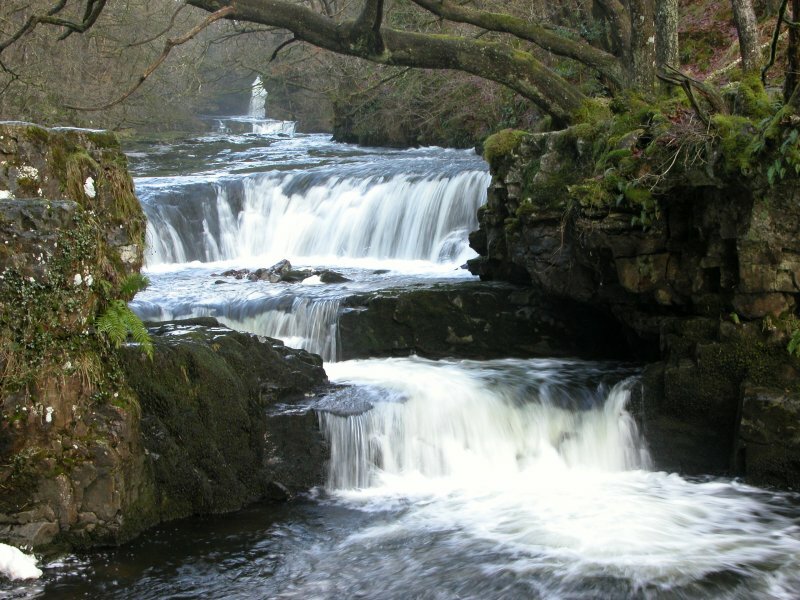 Including Pump Pwll, Sgwd Gwladus, Craig Cilfach-bronwydd, Sgwd Einion Gam, Horseshoe Falls, Sgwd Ddwli Isaf, Sgwd Ddwli, The Great Chasm and Cwm Pwll-y-Rhyd. From Cardiff, take the A470 to the end of Merthyr Tydfil. From Merthyr Tydfil, take the A465 to the left towards Hirwaun, follow it over the hill, and down to the next roundabout. Take the second turnoff, remaining on the A465, to the next roundabout. Take the second turnoff onto the A465 dual carriageway. Take the first exit off the road after about 4.5 miles to arrive at some traffic lights (the start of Glyn-neath). For the main walk or Cwm Pwll-y-Rhyd and The Great Chasm, turn right at the traffic lights. Take the first proper left, and follow it to the Angel pub (which does great pub food). For the main walk, park in one of the small parking areas. SN 9008 0763. For Cwm Pwll-y-Rhyd and The Great Chasm, continue along the road through Pontneddfechan and onto the moorland. 2.5 miles after leaving Pontneddfechan, turn left onto a lane signposted to the Nedd Valley - the second left after passing a tiny village with a fuel station (the first left is a driveway). Follow it for just over 1.5 miles, past a house with a duck pond, to a track on the left and some parking space - if you reach the Blaen-nedd Isaf farm, you have gone too far. SN 9123 1401. If needed, there is some more parking space down the track, but this belongs to the farm, and the track is very steep. 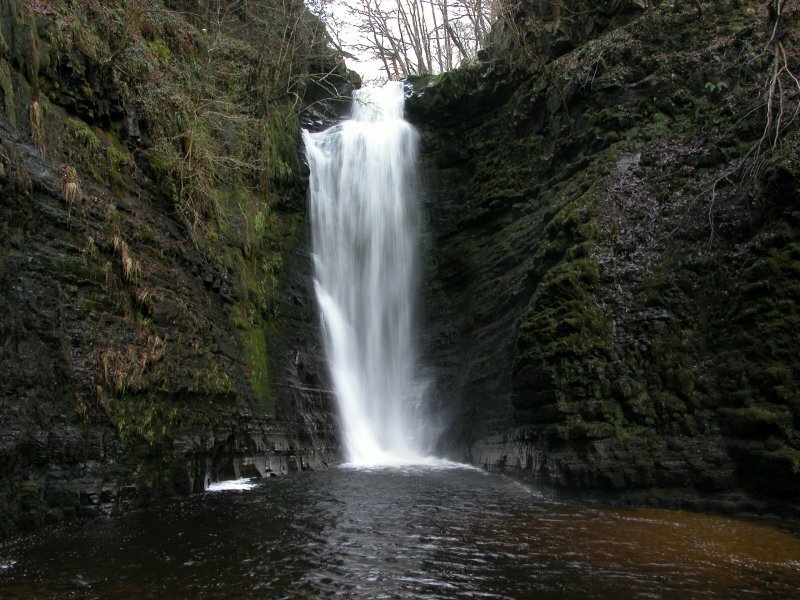 For the upper Pyrddin waterfalls, at the traffic lights in Glyn-neath, continue ahead along the A4109, which climbs steeply onto a plateau. About a mile after the road has levelled out, a lay-by on the left (the first since Glyn-neath) offers parking space. SN 8781 0922. 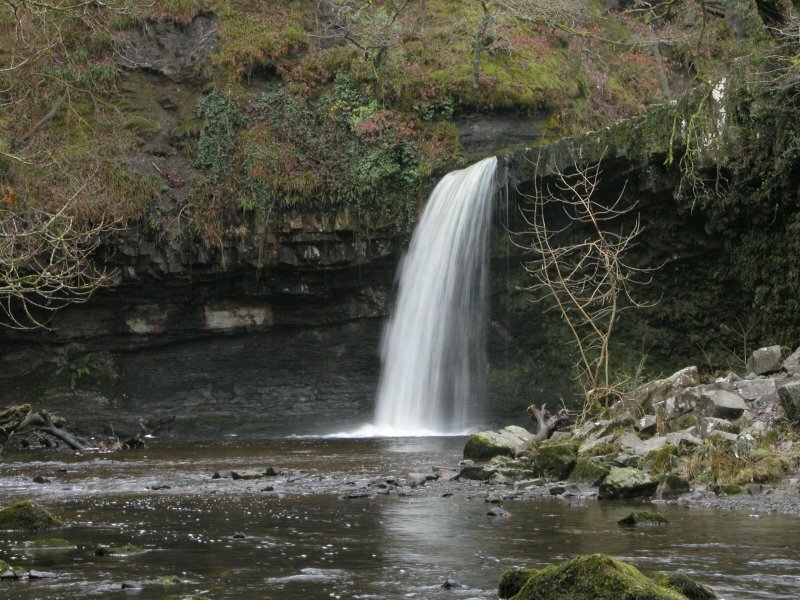 This is one of the most celebrated of Welsh waterfall walks, and in my personal opinion is one of the best in the country. As one of the very few dedicated and named waterfall trails, it is one of the highlights of my lists. If you only have the opportunity to do one waterfall walk in the country, this route would be one of my first suggestions. Just behind the pub is a gate marked "Sgwd Gwladus". Go through the gate, and follow the path all the way up (quite a way) to a bridge over the river, where another river joins from the right. 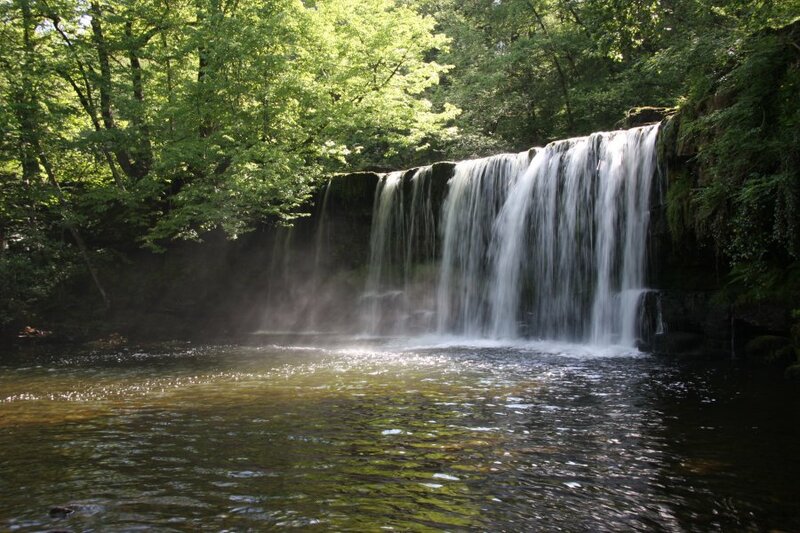 Stay on the left, and continue upstream past a small cascade (Pump Pwll) to the first big waterfall (Sgwd Gwladus). Go back to the bridge, and cross it. Go up the other river, along a somewhat exposed path (take care), past some cascades, to a set of cascades with a horseshoe-shaped rim at the top (Horseshoe Falls). Continue past it to the top of another two-step waterfall (Sgwd Ddwli Isaf), and beyond that to another waterfall (Sgwd Ddwli). Continue past this to another cascade, and a picnic site with a parking area at Pont Melin-fach. This is where most visitors will end their visit, and the following extra sections are only suggested for more experienced visitors. 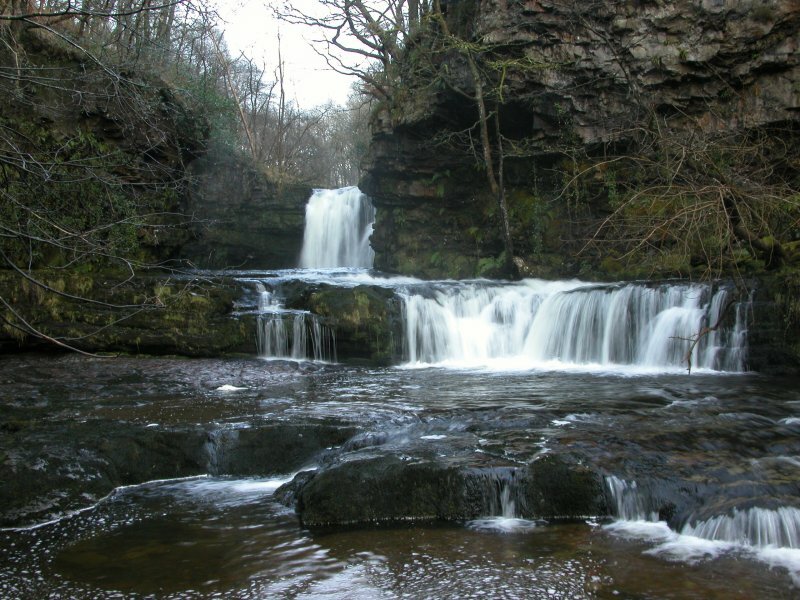 Optionally, experienced river walkers may want to continue beyond Sgwd Gwladus to the next waterfall upstream. Either walk behind Sgwd Gwladus, or use the first bridge to cross over to the path running up the right bank, then take the path climbing above the right side of Sgwd Gwladus. 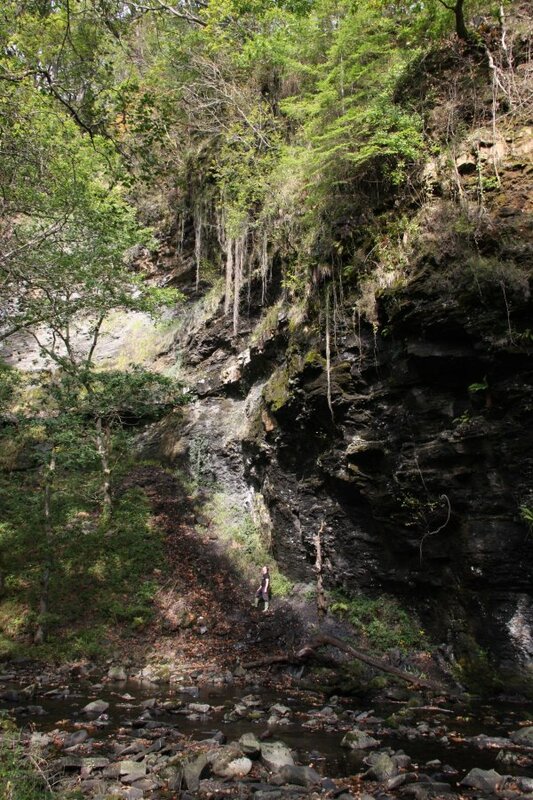 Follow a poorly defined path by the river bank, fording the river when needed (medium-low water levels are needed - take care), to reach the base of a small cascade below the huge Sgwd Einion Gam. To get to the base of the waterfall, there is a narrow path skirting the right side of the cascade's plunge pool, requiring a small scramble. Ford the river one last time at the top of the cascade, and enjoy Sgwd Einion Gam. The first large cliff on the right while walking upstream from Sgwd Gwladus contains a tall waterfall on a small stream, which I refer to as Craig Cilfach-bronwydd. Also optionally, a path continues upstream on the other side of the river at Pont Melin-fach. At the next bridge over the river, Pont Rhyd-y-cnau, a track to the right can be followed to some narrow lanes, where a variety of routes can be used to get to the start point for the Four Waterfalls walk. This provides some options for creating a lengthy looping route taking in both sets of waterfalls. If you plan on taking this route, take a map, and choose the best route for you. 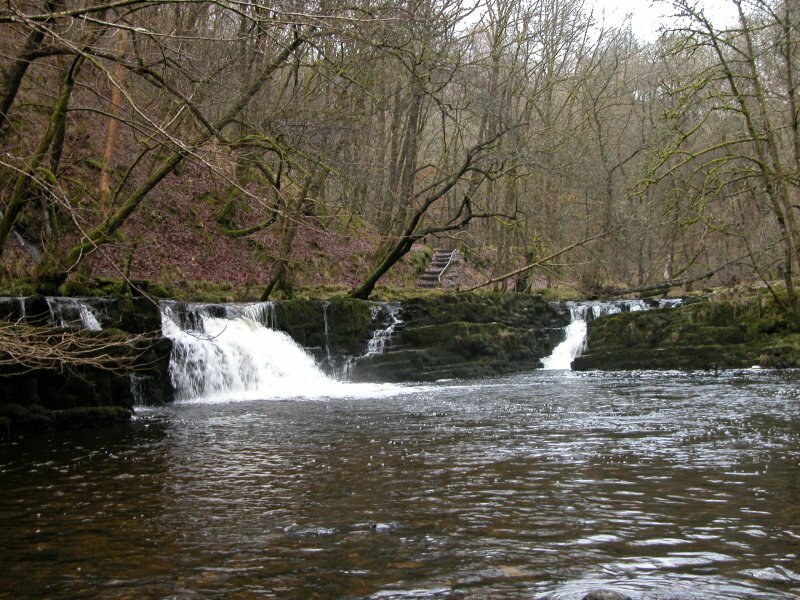 These two waterfalls are a long distance further upstream from Pont Rhyd-y-cnau. Walking up the river from Pont Rhyd-y-cnau is not advised, as there is no good path for a large part of the route. The best access point is from the parking area near Blaen-nedd Isaf. The Great Chasm's waterfalls flow in most conditions, but are more impressive in flood. 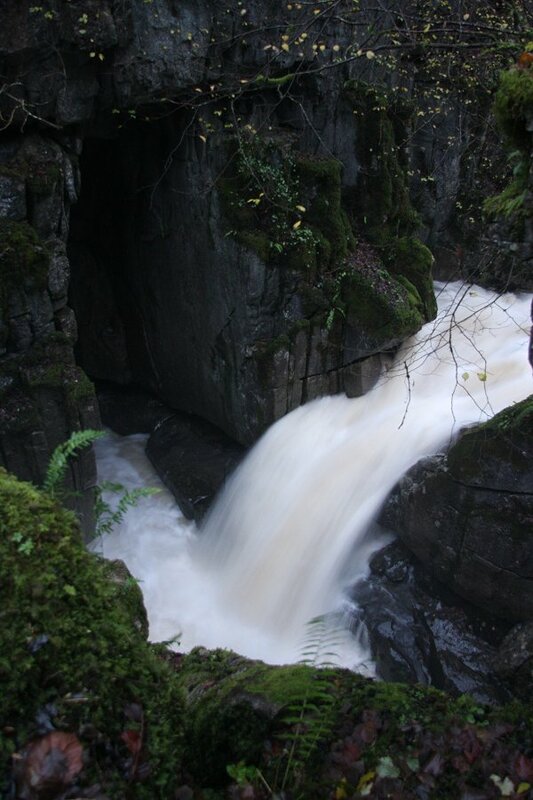 In high flood, there is another cascade at Cwm Pwll-y-Rhyd, where the river disappears temporarily into a cave system. This is dry in normal conditions, as the river sinks into other caves. Great care must be taken due to the nature of the river, and only experienced river walkers should follow the part of the route leading to Cwm Pwll-y-Rhyd. You will need to consult the owners of the Blaen-nedd Isaf farm for permission, and they may charge a goodwill fee for access. If you would like to enter The Great Chasm itself, you will need to consult with the owners of the Dyffryn-Nêdd farm (which is visited on the walk) for permission, and they may charge a goodwill fee for access. Walk back down the road for 1.75 km, passing the farm with the duck pond, to reach a junction with a lane to the right leading to the Dyffryn-Nêdd farm. Turn right, and follow the lane down to the farm (where you may ask for permission if needed). Immediately before the farm, turn right onto a farm track, leading beside a stone wall up to a gate. Follow the track through the gate, and turn left with the track, to pass the remains of an old barn. Beyond here, the track turns left and descends very steeply, zigzagging to reach a bridge over the river. Cross the bridge and stay with the track as it climbs up past the remains of the old Cwm farmhouse, which has a tree growing over the stonework. Shortly afterwards, on the left, The Great Chasm may be glimpsed through a cleft beyond a fence to the left. From the track, it looks like a quarry, but it is a natural limestone shakehole. 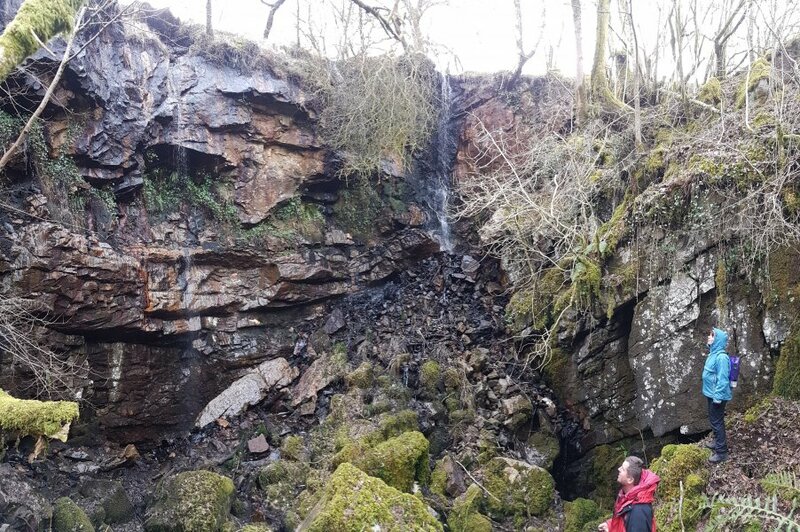 The far wall has 3 waterfalls, and there is a fourth waterfall entering the Cwm Hew Bwb cave between the rocks down on the right. For the best view, cross the fence to enter the chasm, but take great care, as this is a shakehole, and is less stable than a regular waterfall. Return to the track and continue up it into a field, where it becomes a path. Follow the path across the field, where it skirts the trees which line the valley below. After a few more fields, the valley's trees swing away from the path, and it runs across the middle of the next field, passing through a dry stone wall into another field. From here, ignore the path continuing over the fields ahead, and instead look for a path leading up ahead-left through the trees. This passes the remains of another old farm, and shortly beyond here, it joins a far more significant track running above the valley. Follow the track ahead-right, passing some very significant shakeholes on both sides of the track, to reach a junction. Take the track to the right. Follow it down to the river, and cross the bridge to reach the overflow parking area. For visiting the Cwm Pwll-y-Rhyd waterfall, the river needs to be flowing very well past the bridge (if it is dry, there will be no waterfall). Walk downstream along the left bank of the river to a point where the river makes a deep pool up against a cliff on the left side - if there is no pool, then the river is not flooding enough. The path now becomes very narow and exposed, running along a ledge a few metres up the cliff. After this short ledge path, it returns to normal before climbing over some small crags. The Cwm Pwll-y-Rhyd cave and waterfall lie below the crags, and are best seen from the far side, once the path drops down into the dry valley. Return to the bridge, and continue up the track to reach the road, and the parking area for the walk. Upstream of Sgwd Einion Gam, there are a series of other waterfalls on the upper Pyrddyn that are rarely visited, and do not have any official path - therefore they are suggested for experienced river walkers only. 200 metres beyond the upper Pyrddyn waterfalls parking area, a track on the right is the way to the waterfalls. Some way down the track, it swings a right then left bend. At this point, the first waterfall can be heard down to the left. It is the best of the set, so pay it a visit, then head downstream to where the track crosses the river. From here, head downstream. The right bank is best overall, but you may want to start on the left, and ford the river when needed. At one point, a footbridge crosses the river. Beyond here, the river digs a short little gorge, then starts to dig a much deeper gorge after the first one ends. I would advise stopping here, as the head of Sgwd Einion Gam is all that lies downstream.